JackpotCity.com is no newbie to the online casino industry, but rather one of the most reputable and best known casinos of online industry. They’ve been operating since 1998, when they launched under the belt and software of MicroGaming. Not much has changed in regards to software and they still offer over 450 thrilling games from the aforementioned software and game development company. They’ve tried to create a real Las Vegas experience to all their visitors and you can get that away from visiting their website at www.jackpotcity.com, which kind of uses the concept of ”Welcome To Fabulous Las Vegas” sign as well as a sky line of the city. I never get tired of MicroGaming’s casino platform and I talk, review and face it a couple of times on a daily basis. Let me start with the good aspects, which are compatibility and game variety offered to computer and mobile users. 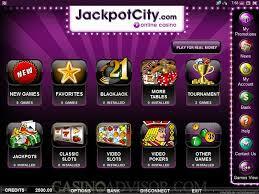 JPC mobile casino is compatible with Android, iOS, BlackBerry and Windows Mobile. Truth is that it is compatible with pretty much all mobile phones and tablets, unless you’re still living in 2000! Ease of usage should also not be overseen, as it’s a really important aspect of any online casino site. You really get a feeling that everything is in the right, correct place when you visit the homepage of JackpotCity. No need to spend several hours looking for that download button or anything at all. It’s all placed conveniently in front of you, right how it should be. Portfolio of close to 500 online casino games definitely counts for something and all MicroGaming powered casinos are quite like that, including JackpotCity. Users of the downloadable version, which is compatible with Windows, will be able to play 450 casino games, while those using the instant flash version will have close to 250 of these. What games are offered? Well I certainly won’t be able to list all of them here, but rather will list the top 5 games, in my opinion, offered. These will all be slots, as I don’t seem to recall MicroGaming as the inventors of roulette or blackjack! 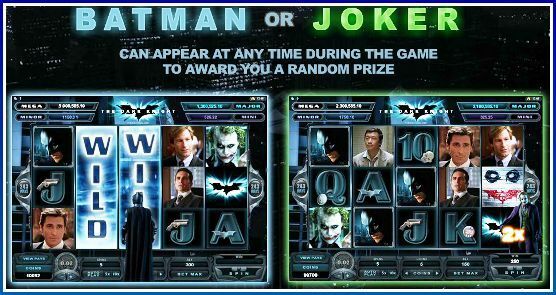 The Dark Knight – are you a fan of Batman or slot machines themed after him? I’ll be really honest here and tell you that most games developed based on this character currently out there are pure crap. Though, it’s not the case with this one. Why? Well, for starters, it is linked to Mega Moolah’s progressive jackpot network, which means that you’ll be able to claim 4 different progressive payouts. There also are free spins and bonus features as well as a special dark knight one. All in all, MicroGaming have developed the best Batman slot currently out there. Mega Moolah – the greatly known progressive jackpot slot machine introduced by MicroGaming somewhere around 2008. It did not take long before it became a huge hit, which is a status it somewhat enjoys up to these days. The highest jackpot ever paid by ”Moolah” exceeds $9 million, so we are talking about serious ‘business’ here. In hindsight though, it is a very simple game with nothing even remotely complicated: 5 reels and 25 pay-lines merged with an African safari theme. Immortal Romance – this is way more advanced and modern slot machine than the previous one we looked at. It was released about 2 years ago, in December of 2011 and emphasizes on the theme of wild desire and forbidden love, which kind of reminds me of the big hit saga Twilight. Several similar characters are also included as symbols spinning on the reels. Features wise, you will get a chance to win in 243 ways, trigger one of 4 free spin features as well as the wild desire feature, which triggers randomly and turns up to ALL symbols into wild ones. Thunderstruck 2 – while this slot machine seems completely different compared to Immortal Romance, the two actually share the same framework and features. Thunderstruck 2, though, is themed after Nordic God known as Thor. Similarity of features comes from the fact that this game also offers multiple free spin features, a randomly triggered wild feature as well as 243 ways to win – for sure one of the best slot machines. 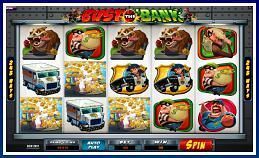 Bust The Bank – a relatively new online slot that was launched on the 8th May of 2013 and is now offered by all MG powered casinos, including JackpotCity. It uses a concept of 243 ways to win, which seems to be supported by mainstream of slots players. While it isn’t a progressive jackpot slot, you will still hold a chance of claiming a fixed coin jackpot of up to $135,000. You don’t have a JackpotCity Casino account? That’s great news, as new players qualify for our highly EXCLUSIVE welcome bonus of $1,600 on your first 4 deposits along with 30 free spins, credited to your account after your first deposit. How does it work? Well, just visit www.jackpotcity.com and claim four 100% match bonuses, up to $400 each. They will know that you are a player of our crew and thus offer you an exclusive bonus offer! If that’s not enough, you’ll also get all other promotions ran by JPC on top of these bonuses – merged in terms of value. Even better, their VIP loyalty program, albeit quite basic, will also go on top and improve your cash back for playing even more. JPC have been in the industry since 1998, which is 15 consecutive years. What you should assume and what I already know is that their payment processing was a big and important aspect in ”making it” and a reason why they still are in this business. I’m sure it also is important to you, a chance to receive payouts quickly and withdraw through a variety of banking methods, isn’t it? Yeah, I though so. Well, when you join Jackpot City, you will have a chance to deposit and withdraw money by using one of over 50 methods that they have on the offer. This includes commonly used methods, such as credit or debit cards along with e-wallets and prepaid cards, such as Neteller, Skrill, WebMoney, InstaDebit, uKash and many more. It even goes as far as offering your local bank for deposits and withdrawals, which obviously is very convenient for you. Payout processing is the only con I can think of in regards to banking at JackpotCity Casino. They usually process withdrawals within 48 hours of the time you have requested them. This is a little bit too long period of time, given that it actually is possible to provide instant payouts! Alternative, browse around their website and chances are that you might find a solution or answer to your question yourself. Because they have been in the industry for 15 consecutive years and the chance of them screwing you over a couple of hundred or thousand dollars is equal to the chance of aliens taking over the world tomorrow. There’s also the fact of them offering over 450 casino games, either a downloadable casino or an instant flash one and, of course, a mobile casino with 40 games. Lets not forget that we have an exclusive offer with JackpotCity – join and make a deposit now to receive $1,600 free on your first 4 deposits + 30 free spins after your first deposit!